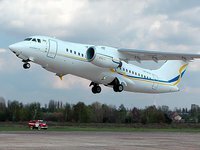 The Antonov State Enterprise (Kyiv) links plans to promote regional passenger next generation An-148/158 aircraft with a capacity of up to 99 passengers to the market with partnership with Cyprus-based Montag-Girmes leasing company. Antonov Vice President for Marketing and Sales Yuliy Kiselev said at a conference with Ukrainian airlines, which are potential operators of the An-148/158 aircraft family in Kyiv on Friday, the enterprise has reached an agreement of cooperation with Montag-Girmes to supply An-148/158 aircraft under leasing contracts, including to the Ukrainian market. He did not disclose the details of the agreement, adding that Montag-Girmes took part in the supply of An-158 aircraft to Cuba. Antonov President Oleksandr Donets said that the company expects that the level of after-sales support of the An-148/158 aircraft family will be considerably increased in cooperation with U.S. Avial. "Our American partner, Avial, will participate in the after-sales support of our aircraft through its logistics network," he said. According to Antonov's estimates, the Ukrainian regional jet An-148/158 have competitive market characteristics, including fuel consumption and operating costs, compared to foreign analogues in its class - Brazilian Embraer and Canadian Bombardier. At the same time, the catalog price of Ukrainian aircraft is 15-25% lower than foreign analogues, and it is about $32 million.